Firm Grip on an Empty Bag? Amazing how much you learn from the past. Too many people are stuck in today and give no thought for tomorrow. This is a critical error. If you live paycheck to paycheck, you are a disaster waiting to happen. You must take control!! It has been through years of trial and error that I have learned to learn those things that I did not know about myself. We all have a wonderful tool called our “mind” that when used properly will produce for us a life worth living; or through our own neglect will destroy us. Dissatisfaction is a creative force. This is the mindset that has allowed me to rise above my circumstances and create the life that I want. I cannot tell you what your purpose is, nor can I tell you how long it will take to find it. I can tell you this; never negotiate the price of success. It is my belief that success is all encompassing; you cannot be successful in one area of life and not be successful in all areas of life. Many times I have read about “balance”. To me balance is learning to do what needs to be done, when it needs to be done. This may seem ambiguous so I will attempt to clarify. I believe that when I am at work, my focus is on my work. When I am home, my focus is on my family. Wherever I am that is where my focus is. For me this view has made a big difference and has become my definition of balance. There is a price that must be paid, you can choose to pay the price of success or by default; you will pay the price of failure. Choice my friend is the difference between success and failure. Understand that your life right now is the sum total of all of the choices you have made to this point. If you are not where you want to be, change your choices! You, my friend have talents and abilities that will allow you to do more with your life than you may believe possible. Develop yourself through reading positive books, seek and associate with those that share your desire for achievement and never stop pursuing your dreams! Living in the Stone Age. Firm Grip on an EMPTY BAG! People, mostly union and retired city workers, protest in front of the U.S. Courthouse where Detroit’s bankruptcy eligibility trial began this morning October 23, 2013 in Detroit, Michigan. Weak investment performance and insufficient contributions will cause total unfunded liabilities for U.S. state public pensions to balloon by 40 percent to $1.75 trillion through fiscal 2017, Moody’s Investors Service said in a report on Thursday.The report comes amid increasing concern over America’s ability to pay promised retirement benefits to public employees without draining state budgets.It has been a tough year for the funds, which earned a median 0.52 percent on investments in fiscal 2016 versus their average assumed return rate of 7.5 percent, Moody’s said. By most measures Illinois ranks worst, with unfunded liabilities of nearly $193 billion in 2015 according to Moody’s. Other measures put the number at $111 billion. “We cannot invest our way out of this hole,” said Richard Ingram, executive director of the Teachers’ Retirement System of Illinois, at a New America Alliance event in New York on Thursday. He blamed underfunding on “political failures” and a “lack of discipline,” noting that the state never met its full annual contribution in seven decades. Though the fund only recently lowered its assumed rate of return to 7 percent, it could drop the rate again to 6 percent this spring, he said. “The last couple years have been bad,” he said of investment returns. “You’re going to see a slide” in funded status. I wrote this to myself and decided to share it. Weak investment performance and insufficient contributions will cause total unfunded liabilities for U.S. state public pensions to balloon by 40 percent to $1.75 trillion through fiscal 2017, Moody’s Investors Service said in a report on Thursday. The report comes amid increasing concern over America’s ability to pay promised retirement benefits to public employees without draining state budgets. It has been a tough year for the funds, which earned a median 0.52 percent on investments in fiscal 2016 versus their average assumed return rate of 7.5 percent, Moody’s said. In fiscal 2015, aggregate adjusted net pension liabilities stood at $1.25 trillion. Half of U.S. states did not put enough money into their retirement systems in 2015 to curb the growth of unfunded liabilities. That held true even when states met the contribution levels their actuaries told them were necessary, Moody’s found. 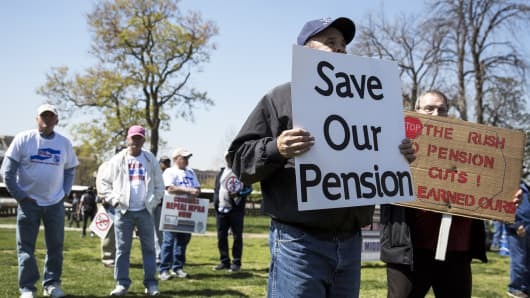 The nation’s 100 largest public pensions were funded just below 70 percent as of June 30, according to a separate study on Thursday by consulting firm Milliman. That study found investment returns to be 1.31 percent and a funding deficit of $1.38 trillion. Yet well-known problem spots – Illinois, New Jersey, Connecticut and Kentucky – are atypical, according to the Center for Retirement Research at Boston College. People attend a rally outside the Capitol in Washington, D.C.
During the Great Depression the size of government grew exponentially and many believed that the United States had lost those essential principles that made this country the most prosperous on the face of the earth. It was during this time that an organization was formed, called the American Economic Foundation (AEF), and they put together the following “Ten Pillars”* to remind Americans what works in an economy. If people wondered if a policy was good and beneficial to everyone concerned, then it would stand the test of these Pillars. 1. Nothing in our material world can come from nowhere or go nowhere, nor can it be free: everything in our economic life has a source, a destination, and a cost that must be paid. Simply put, “There is no such thing as a free lunch.” Yet there are many able bodied Americans dependent on government, charities and family members. Some “tough love” is in order (another discussion). Everything has a cost regardless of promises from politicians. 2. Government is never a source of goods. Everything produced is produced by the people, and everything that government gives to the people, it must first take from the people. All government punishes good behavior, and rewards bad behavior. Many Americans need to be familiar with this Pillar in particular. Government “help” breeds dependency. There is a lot of money in poverty, There are a few individuals that use “philanthropy” as a front to enrich themselves (another discussion). Much of the new spending we have seen by Obama (and Bush) and government in general, is being financed by fiat money (essentially counterfeit) and will result in rampant inflation. Inflation? Inflation is in essence, the devaluing of a currency. The current philosophy of “Quantitative Easing” is flawed in concept because there is only a government promise, an IOU that backs up the money being printed, read point 3 again. Other parts of the spending will be paid for by future generations, which is the choice of the present generation. Finally, some will be paid by foreign governments who invest in such debt (making us dependent on regimes, like China). 4. In our modern exchange economy, all payroll and employment come from customers, and the only worthwhile job security is customer security; if there are no customers, there can be no payroll and no jobs. Labor unions have long tried to create an economic world that is detached from reality. If labor wants job security, they must accommodate customers. There is no other way to assure long term job stability. 5. Customer security can be achieved by the worker only when he cooperates with management in doing the things that win and hold customers. Job security, therefore, is a partnership problem that can be solved only in a spirit of understanding and cooperation. Unions often want an adversarial relationship with business, but job security can only come if the two are partners pursuing customers together. Government does not pursue customers hence, unions should not be involved with government employees. We are all “coerced” into doing business with the government. 6. Because wages are the principal cost of everything, widespread wage increases, without a corresponding increase in production, simply increases the cost of everybody’s living. An example of this is the minimum wage. When it goes up, so do prices, and if the job isn’t worth the wage, it will be lost. This solves the mystery as to why minimum wage increases are both rare and devastating. 7. The greatest good for the greatest number means, in its material sense, the greatest goods for the greatest number which, in turn, means the greatest productivity per worker. Production is the best way to keep an economy strong, and those who participate in it growing financially are also rewarded. The best way to encourage productivity is for a government to keep the costs of production as low as possible. This is done through a stable money supply, low taxes, and few regulations. 8. All productivity is based on three factors: 1) natural resources (NR), whose form, place and condition are changed by the expenditure of 2) human energy (HE) (both muscular and mental), with the aid of 3) tools (T). NR + HE x T = Man’s Material Welfare. 9. Tools are the only one of these three factors that man can increase without limit, and tools come into being in a free society only when there is a reward for the temporary self-denial that people must practice in order to channel part of their earnings away from purchases that produce immediate comfort and pleasure, and into new tools of production. Proper payment for the use of tools is essential to their creation. Tools are the only one of these that can increase without limit. An example of this is agriculture, which was the dominant industry in the late 1700s and early 1800s, with the majority of our population working in that area. Today, the number who work in it are in the single digits and the abundance of food could not be greater. Tools are what have changed everything. 10. The productivity of the tools–that is, the efficiency of the human energy applied in connection with their use–has always been highest in a competitive society in which the economic decisions are made by millions of progress-seeking individuals, rather than in a state-planned society in which those decisions are made by a handful of all-powerful people, regardless of how well-meaning, unselfish, sincere and intelligent those people may be. n the majority that would impose its view of “fairness” on the economy. This is the “invisible hand” that Adam Smith spoke of so eloquently in his The Wealth of Nations. These Pillars are factual, logical, and without a political agenda. They provide excellent benchmarks on what works in the economic system. Pass this tool on to others who are trying to figure out the headlines and let freedom ring!